If you’re looking for a soft stuffed animal for your little one to cuddle with, The Little Market has the chicest selection we’ve seen. 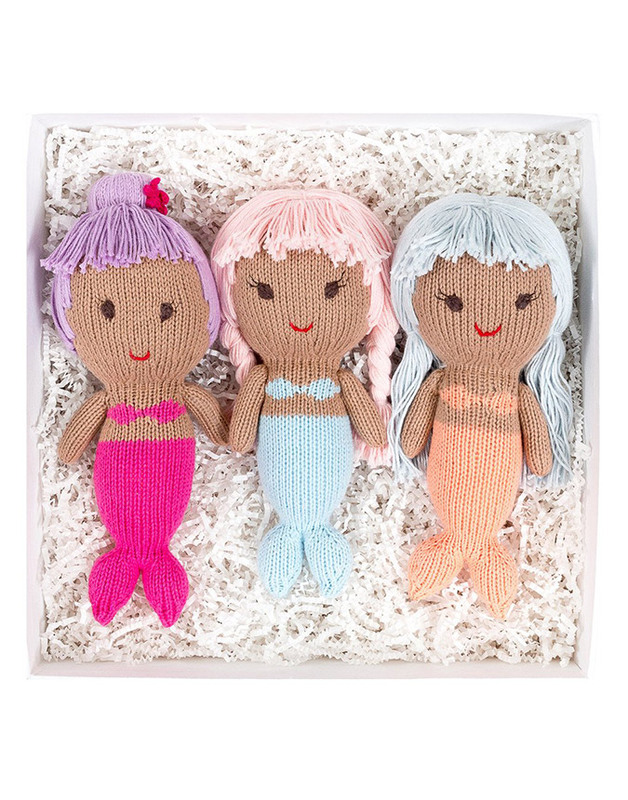 From the cutest knit toys to cozy alpaca critters, every purchase empowers female artisans to rise above poverty and support their families. It doesn’t get much cuter than a baby in a bonnet—until you add a pom pom on top, that is. Talk about a festive addition to your babe’s winter wardrobe! Handmade by female artisans at EllieFunDay in India, this bunny rattle features an embroidered flower crown and soft silk ears. 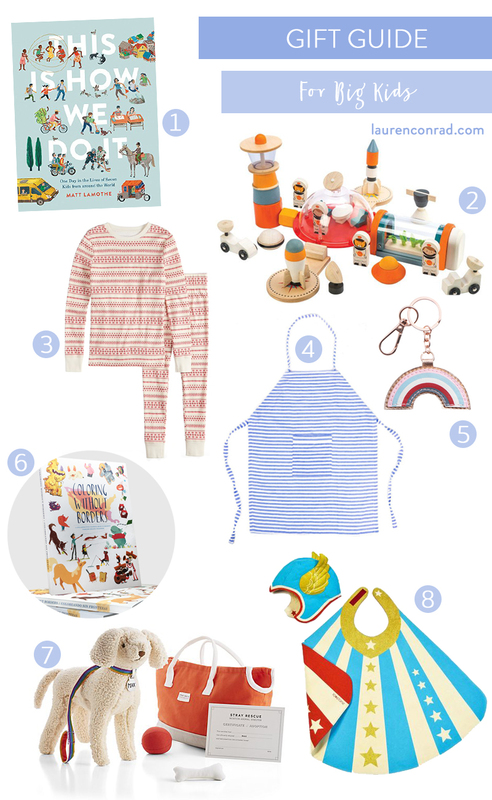 Design savvy parents and little ones alike will appreciate this gift. This whimsically illustrated board book offers a delightful A-to-Z overview of midcentury modern designers. The perfect early introduction to feminism, this board book pairs adorable illustrations with rhyming text to explain in an age-appropriate way that girls and boys are equal. Made in Bolivia from 100% alpaca wool, we love this dapper scarf that stays put. These bibs and placemats are a popular pick amongst all our mama friends and a total diaper bag staple. Especially for eating out, you will want one of these sets on hand at all times. 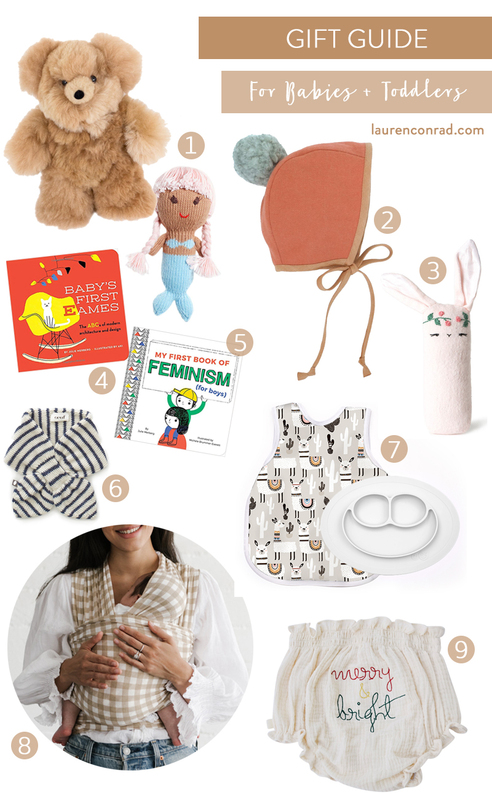 Solly wraps continue to be one of our go-to gifts for newborns. Keep your little one cozy and close to your heart this holiday season. How cute is Harbour Clothing’s holiday collection of their classic bloomies? Pair with a gauzy tunic or dress, and add a monogram if you wish! By far one of the most fascinating children’s books for adults and kids alike, this book offers readers an illustrated take on how seven real kids from different countries go about a typical day, from what they eat, to what they wear, where they sleep, and their favorite games to play. Talk about a toy set that is literally out of this world! Little ones will love imagining they are playing in a space station, complete with communication towers, astronauts, and UFOs. If a pair of cozy new PJs is one of your go-to holiday gifts, allow us to introduce you to this matching family set from Lauren’s Kohl’s collection. We won’t judge if you snag a pair in your size too. The perfect gift for the kiddo who likes to help out in the kitchen, these mini aprons also come in adult sizes so your little ones can wear a matching apron with mom or dad. Whether you need a stocking stuffer or a package topper, your kiddo will love this pretty keychain to clip onto their backpack. Featuring illustrations from over 80 internationally renowned artists, all the proceeds from this coloring book go to Families Belong Together. Each page features text in both English and Spanish, and unlike your typical color-within-the-lines coloring book, this book calls for kiddos to complete parts of each illustration themselves. As you may know, we’re big proponents of rescue pets. This stuffed animal set, comes with a leash, ball, bone, and adoption certificate. For the superhero obsessed kiddo, Lovelane Designs makes 100% natural cotton canvas dress up clothes including super hero capes, cuffs, helmets, tiaras, and more. What are you buying the little ones on your list?